Trust me on this, it will be one of the best decision of your life that you want to start a blog. I can tell you a number of benefits of starting a blog. Starting a blog is not as hard as you would expect. While there is a bit of a learning curve involved, with a little time and patience, even the least tech-savvy people can learn. In this article, you will find a step-by-step guide to starting your own blog. Read the guidelines I’ve compiled for you, and feel free to take all the advice I am sharing. There’s a reason why WordPress.org powers over 91% of all the blogs on the web, including 62% of the top 100 company blogs. But please don’t rush out and sign up just yet! I’ll be showing you how to install WordPress in just one click and how to configure it all — but there a few quick things we need to do first. Couldn’t I just start a blog for free on a site like Blogger? Your site will be hard to find. Want a nice site address like “Yourblog.com”? Too bad. With a free site, you’ll be stuck with something like “yourblogname.blogger.com” – so less people will find your content. You won’t control the content. Imagine losing years of work when your blog is taken offline because you broke a rule without knowing it. Sound far-fetched? It happens all the time. You can’t customize your site the way you want to. No free plugins to add functionality like calendars or online shops. Limited themes, so your site looks like everyone else’s. Boooooring. You’ll find it expensive to switch. When you decide you want more control, switching from a free platform to something like WordPress can take hours of manual work and formatting. Someone else will profit from YOUR hard work. This is the worst one: free platforms reserve the right to put ads all over your content. Imagine seeing a huge, ugly pop-up for a product you don’t even support on your blog– and not making a penny off of it! Unfair, right? You’re better off creating a WordPress blog that can grow with you. Here’s where things get tricky. WordPress runs two separate sites. There is WordPress.ORG and WordPress.COM. WordPress.com is free, but it’s not what we recommend. While blogging on WordPress.com comes with no price tag it also comes with its limitations. The WordPress we mentioned above that offers all kinds of individualizations is actually WordPress.ORG. WordPress.com does NOT offer custom theme (i.e. layout) customizations, does not allow you to monetize and limits you to very little storage space so unless you plan to post once a year, you’ll end up having to buy more space from them anyway. WordPress.ORG on the other hand offers thousands of themes, the ability to purchase and install new themes, unlimited space and most importantly, the ability to monetize. But it does come at a cost. A cost, which we feel strongly is worth it. You need a platform on which to blog, but your platform needs a place (i.e. a host) to store all of your content. It’s purchasing this host that will cost you. Luckily, it isn’t very much and there are some extremely reasonable options out there. I suggest Bluehost because the setup is seamless, the pricing is reasonable, and they are a reliable hosting company. They also only cost $4.95 a month. That’s a latte a month. Then there’s the matter of purchasing your domain name. Your domain name is your blog’s URL. You want this URL to be yours and yours only and not owned by anyone else. So instead of droppedweb.wordpress.com, I own droppedweb.com. Most hosts make you buy your domain name externally (through sites like godaddy.com) but Bluehost includes the cost of your domain making it by far the most affordable host on the market. It also works hand-in-hand with WordPress so the second you purchase hosting it will direct you to WordPress so you can set up your account and have them linked. If you’ve logged out of WordPress, type inhttp://your_domain.com/wp-admin/ to log back in! 4. Publishing Tools: This is where you get your post shown to the world. 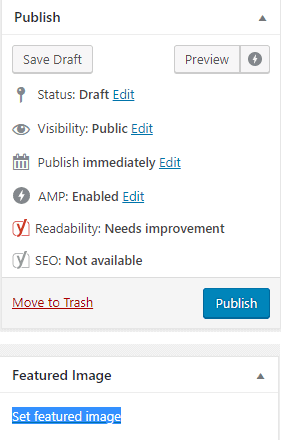 The most important thing to note here is the big, blue “Publish” button you’ll push when your blog post is ready. You can click “Save Draft” on an incomplete post to save your work without pushing the post live. The “Preview” button can be useful to test out how your post will look when it’s live without having to publish it right away – especially when adding images or videos. 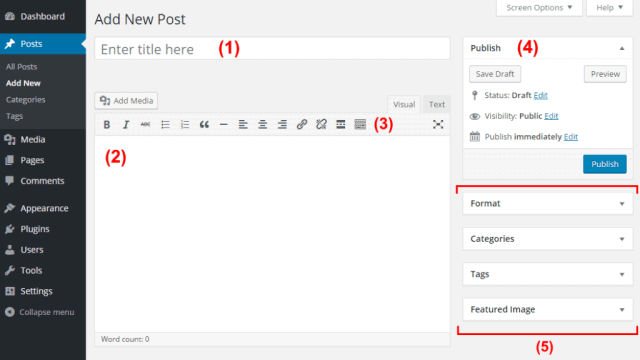 WordPress categories and tags here. WordPress will strip out all of your previous formatting, so you can customize the text to look exactly how you like. Headings help you structure your content and make it easier for people to read. For example, in the text above, “Adding headings” is my heading! This helps people who want to scan content find what they need. Consider adding headings for each of your main points. To add a heading, scroll up to “Paragraph” drop-down menu and select the heading you’d like to use. Note that the “Heading 1” is usually reserved for the post’s title, so stick to the smaller headings (with larger numbers) inside the post. Quick tip: “Heading 1” is usually reserved for the blog post’s title, so you shouldn’t use it again in the body of your content.Consider using “Heading 2” to break down the different sections of your content, and “Heading 3” for sub-headings inside those big sections. Trying to get more traffic from Google? Google loves to see the keywords you’re targeting in your headings, so try to use them naturally! It’s a good idea to link to other (credible) websites: whether to share a piece of content or back up a claim you’ve made, or share another one of your own posts. WordPress makes it easy. To add links to your posts, highlight the desired text (for this example, I just wrote “Add links” as my text) and then scroll up to the blog menu. 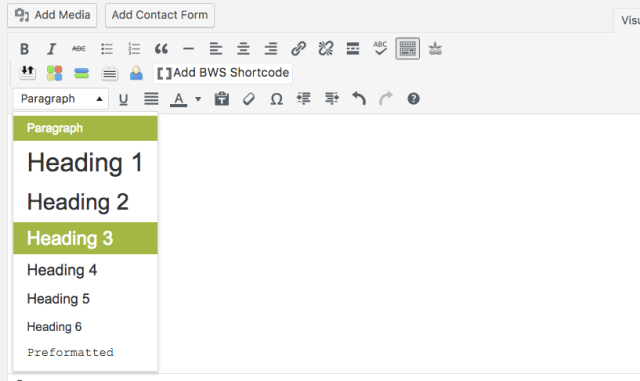 Click the button that looks like a paperclip, to the right of the “Align right” item and above the “Add BWS Shortcode”. Click the “Open the link a new tab” box. This is important—you don’t want people to leave your site when they click on a link! I touched on this briefly before, but I’ll explain it more here. Start by scrolling up to the top of the blog menu and click “Add Media” in the top left corner of the menu. From here, select the files you’d like to upload. 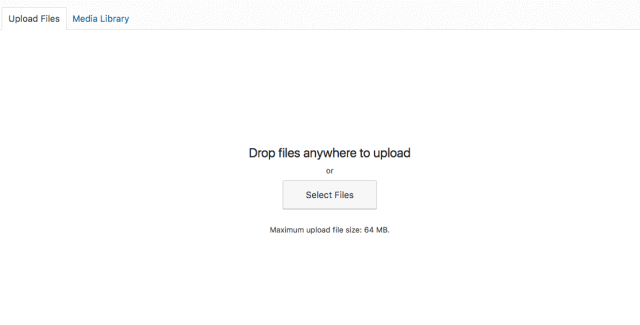 You can find previously uploaded files from the “Media Library” at the top-left corner next to “Upload Files” – no need to upload them again! A featured image is simply the image that will be displayed at the very top of your post, and will be used in the thumbnails of your article when you share it on places like Facebook or Twitter. To add a featured image, run your mouse along the right sidebar of your blog menu. You’ll see an option titled “Set featured image”. Click that, then go through the same uploading process to add an image as you did in the step above. Quick tip: Try to pick a featured image that draws the eye – you’d be surprised how colorful, weird, or interesting images can make a HUGE difference on how many people will click through to read your blog posts! All done? Click that “Publish” button. Then click “View post” when the link appears to see your new post live in action! Congratulations! You just published your first blog post. But don’t stop there! So, for beginner bloggers planning to start a blog, my recommendations are simple. Learn how to build reputation and traffic first and keep making money for later. Even if you place 1 million ads on a blog with little traffic, it will make nothing or very little. So, now you know the secret of how to start a blog and make money.